In this past year, I decided my next trip was going to be Southeast Asia and there was not a question that part of my travels would be spent alongside my mom. I knew having my mom as a travel buddy was going to be the best for a variety of reasons, but what I couldn't have predicted was just how open to everything and downright adventurous she would be. While our trip had too many highlights to count, some of the best moments were the ones where I looked over at my mom, seeing her out of her element, taking on adventures and loving every second of doing new things side-by-side. 1. 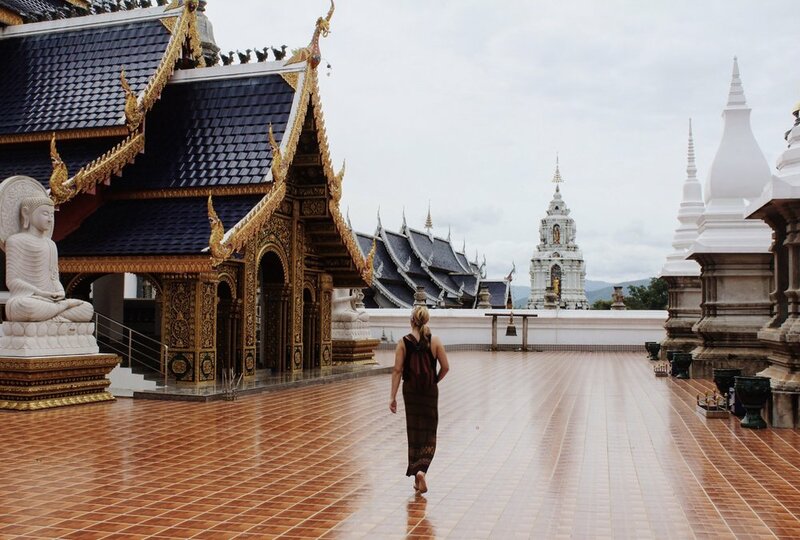 Climbing the Dragon Stairs to Wat Phra That Doi Suthep — Fighting the tiredness of 30+ hour travel day and jetleg, my mom and I started our trip with the climb to the top of the 306-step staircase leading to Wat Doi Suthep. Even though there is the choice of a lift to the top, we didn’t want to miss the experience of climbing the Naga staircase. 2. Trying “Thai Hot”, thanks to the Birds Eye Chili — My mom always jokes that I don’t cook and… she is a little right. So we took on the Thai Farm Cooking school, which picked us up in Chiang Mai and took us to the markets to buy ingredients, and then to the farm to gather organic Thai herbs, including the spicy birds eye chili, before jumping into cooking a multi-course Thai meal. 3. Swimming in the Mork Fah Waterfalls — On our drive from Chiang Mai to Pai, we stopped at the Doi Suthep-Doi Pui National Park and hiked to the waterfalls. After the hike, we immediately jumped into the pools under the waterfalls for a refreshing swim before starting on the rest of the dizzying 762-turn drive to Pai. 4. Riding a Bamboo Raft through the Caves — Following our guide with a small lantern, my mom and I traversed through the Tham Lod Caves outside of Pai. It’s safe to say that I was definitely more scared than she was, with fish the size of my thigh bumping against the bamboo raft and the small scraping noises of bats hanging overhead. When hiking back to our car, we crossed a bamboo bridge that was not for the faint of heart. 5. Exploring the canyons and streets of Pai — One of the highlights of our trip was hands down the town of Pai, in northwest Thailand. In our time exploring Pai, we hiked canyons, swam in hot springs, flew on a giant swing and more. 6. Riding an Elephant — The bucket list experience of a lifetime: riding through the jungles of Thailand on an elephant with your mom by your side. Through Patara Elephant farm, we signed up to be elephant trainers for the day. Throughout the day, we were given an elephant to interact with and take on the responsibilities that their owner would complete on a daily basis. Even though my mom was nervous at first around such huge animals, and even though she was the oldest person in our group, she and I both jumped right in and embraced the experience. 7. Riding in the back of a tuk tuk… to a Secret Beach — Not many moms that I know would haggle with a tuk tuk bus driver, then hop in the back to have him take you to the secret beaches of Koh Samui. We spent a day on this beautiful island toting our beach bags, hopping from beach to beach, and stopping at small restaurants to indulge in local eats. 8. Kayaking and snorkeling in sea caves — We took a boat out to Ang Thong National Marine Park where we explored hidden lagoons and snorkeled into secret caves filled with schools of fish—the natural light shining down exposing life below the surface. Having my mom as not only a travel partner but a full-on adventure partner was an experience that will provide stories for the rest of my life and an experience I wouldn't trade for anything. I can’t emphasize enough the exhilaration of choosing a destination, getting out there, and exploring the unknown with your mom by your side. This article was written by Lindsey O’Connell, see more of her photos on Instagram at https://www.instagram.com/lindzococo/.